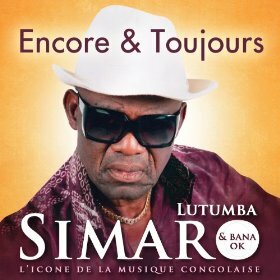 Congolese music legend Lutumba Massiya Simaro, has released a new album. Simaro who turned 76 on March 19th of this year is still going strong and shows no signs of retiring from music even as most of his generation of musicians have either passed away or have retired from music. The title of the album is Encore & Toujours which roughly translates to “Again and Again”. In this album vocals and instrumentals are performed by several young musicians whom Simaro gives a chance to express themselves. Amongst the youngsters is vocalist Um Gen. The album is titled Encore & Toujours and is released under the . It is a combination of rhumba ballads in classic “Lolaka” style of Simaro. It also has dance songs. There are 10 tracks with a total running duration of 1 hour and 26 minutes. The album has remakes of several classics from the TPOK Jazz and Bana OK eras. Fans of Rhumba music will applaud this as the best album to come out of Congo this year. The album is released by Paris based Diego music. This entry was posted in Africa Music News and tagged Bana OK, Encore & Toujours, lutumba simaro. Bookmark the permalink.